As you’re all aware by now, some of the staff at WWD have gone the iPhone 3G route – and are still happy about it. But we don’t have any sort of official “iPhone only” policy, and we’re a diverse bunch. Speaking for myself, I’ve taken a long, hard look at iPhone ownership, and decided against it. Here’s why. 1. 3G Coverage – I’m in that big middle part of the country where, apparently, all the technologically backwards people live. None of the major carriers have anything like comprehensive 3G coverage out here. With the iPhone, that means I’d be paying 3G prices for a device that didn’t get 3G speeds – not much of a bargain. 2. Missing Flash – I’m not a huge fan of Flash user interfaces; I use Firefox add-ons to disable most of them in my browser. But there are a few spots on the web where Flash is an essential part of the site functionality, including Grand Central, which I use to manage all of my phone numbers. As long as there’s no Flash on the iPhone, that’s a deal-breaker for me. 3. Apple Control and Censorship – It’s bad enough that Apple is managing the App Store as a tightly gated software portal with apparently arbitrary rules and poor developer communication. It’s bad enough that they have a “kill switch” that lets them remove any software from your iPhone at any time. But now they’re getting into content censorship as well. The notion of having a computer where Apple dictates, now and forever, what software I can install rubs me intensely the wrong way. 4. Gadget Regret – As I mentioned yesterday, I’ve got some history with gadget regret. I’ve learned over the years to step outside the reality distortion field and ask whether I really need a new toy. With the iPhone, the answer is currently “no” – the amount of money it would cost, balanced against the amount of difference it would make for my ability to enjoy life or bill more, makes it a bad deal for me. 5. The SDK NDA – Apple appears to be bending over backwards to make it tough for developers to build useful iPhone applications. Besides their control issues on software delivery, they’re also still keeping the iPhone SDK under a restrictive NDA. This goes beyond closed source to closed knowledge, and strikes me as a bad idea and one that I do not care to support. So, no iPhone for me. For a phone, I’m still happy with my old, beat-up, not-very-smart Nokia. Your mileage may vary, of course, but if you’re thinking of plopping down the money for an iPhone I’d urge you to think carefully about whether it’s really a device that will make your life better. I agree with Toni Marie. With my laptop and 3G air card it’s almost like at I’m at my desk (home or office). On top of that, I can also listen to streaming audio as well as any cuts from my 100+ GB FLAC-encoded audio collection while querying All Music Guide or reading TechWeb. Does anyone know about the date for release of the iCar? iBought an iBrick, and wear iT around my iNeck with an iChain, but iT’s hard to get around on my iBike (especially when i’M triYing to manage multiPle calls and TetriS on the iPhone). An iCar would be iDeal for hauliNg both of these, in addition to my iWife, my iKids, my iPets and my iRubbish, proviDed Steve approved the iOctane of the iFuels i’D buy. Any iHelp iHere? Michael: You mistake my argument. I’m not saying that the iPhone does less than my battered old Nokia. I’m saying that it doesn’t do enough more to be worth the expense. David: The NDA for the iPhone SDK is restrictive enough that it has prevented books from being published and classes from being held, despite the fact that the software is released. This is considerably more closed than, for example, any released SDK from Microsoft. Brendan, the applications available for the iPhone are not Apple, they are from 3rd parties. I think it’s good Apple has some control over it – stops some crappy developer releasing crap that buggers your handset up! #3 is definitely something that rubs me the wrong way. That’s why I find the Android concept much more appealing. Businesswise for application developers that would be much more interesting. The problem with the iPhone is that is Apple and Apple only. Not a good platform and also strange since the net and related content in my opinion should be as open as possible. Way to give a balanced argument! Not! Apple have publicly stated that the ‘kill switch’ is if an app should be malicious and be causing harm in the public domain, look at netshare for gods sake, its been pulled but if you bought it you can keep it. They are not removing willy nilly! I’m confused about your NDA part…. I have the SDK, and i have seen no more red tape for that than any other SDK….. am i missing something? I hesitated for a long time, but finally splurged on a 1G iPhone. I’m not gadget freak, but I have to say I have never admired and loved a piece of gear like I do the iPhone. I can’t even begin to convey the pleasure of using it, and the number of times it has saved my bacon as a teleworker. No feature-for-feature comparison with other phones or PDAs or computers can capture what makes it so unique in so many ways. I’d rather settle for less features that are a pleasure to use, than more features that are irritating to infuriating to use. My son’s friend can’t even figure out how to send SMSs on his brand new LG phone even though kids his age are SMS naturals (etc, etc.). Illegal AT&T wiretapping didn’t make the cut, huh? re. point 1, I agree this is a problem for some people. On my commute (into London) I’ve turned 3G off as the reception is very hit and miss so use edge and it’s acceptable. #2 I’m happy with no flash, there’s barely any sites I visit regularly which use it. Also I’m not doing all my surfing from the phone, I’m still at a computer 95% of the time so it’s not an issue for me. 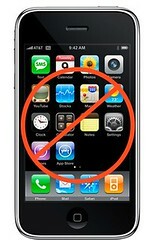 #3 Don’t have an issue with the kill switch / Apple control. Someone needs to have control otherwise it’ll descend into mayhem and there’ll be all kinds of rubbish on there. #4 Again, I know where you’re coming from but my experience with the iPhone is I’d regret it if I hadn’t bought it. To be able to find the nearest starbucks in < 30 secs is awesome. It’s sooooo much better than any other phone i’ve owned. #5 Completely agree, it’s not a clever move by apple, they’ll come to their senses at some point I hope. You iPhone users make it sound like having the internet on your phone is something new. Guess what? It’s been around on other mobile phones for ages. You don’t need an iPhone for that. I use Opera Mini on my N95. I think it looks flimsy! I’m sure I’d break it within weeks. And although I like Apple products, I’m fed up with everyone telling me that I simply MUST have an iPhone – clearly I don’t need one that badly! Can your Nokia play flash in its browser? Your telling me that Nokia doesn’t decide what applications are allowed on that phone? Your also telling me that your not getting the phone because developers can’t talk to each other about development? Who are you, Cory Doctorow? Come on, let’s face it, your phone can’t do half the things the iPhone can and even the things your Nokia can do doesn’t do it nearly as elegantly. Unless you have an issue with touch screens or you need a smaller phone the iPhone will more than likely make your life better. I don’t really have much interest in the iPhone but I am perfectly happy with my Samsung Instinct. It has all the features I need, its comparable to the iPhone (except for the whole apps thing) and it doesn’t have any of the problems you mentioned on your list. In India it is the high price that is preventing me from grabbing one. you can write as many feature lists about the iPhone as you want. Reality is once you used one for a few days you realize how much better it is than anything else currently out there in the market place. Yes it has some quirks… but at least Apple seems to be fixing them quickly. 1) 3G coverage: applies to any device and seem to be mainly a US problem. 2) Missing Flash: I agree. However, I think there are two problems. 1) Performance and 2) how to you interact with a Flash movie using multi-touch technology. I think the later is the reason why this hasn’t been released yet. 3) Apple Control/ Sensorship: Yes, they could abuse it but at the same time this also means no Spyware, Trojans and Viruses like you would expect on the Win Mobile platform. 4) Gadget Regret: Get the iPhone as part of your normal phone upgrade cycle and you won’t have this issue. 5) SDK NDA: I believe they should be a bit more relaxed on source code sharing. I’m so happy I did! This things incredible. Jason – I know about Grand Dialer but (correct me if I’m wrong) it still doesn’t provide a way to listen to my Grand Central messages on the iPhone. That’s a big sticking point. Jamie – I’m using an older Nokia, not a “smart phone” at all. Certainly not a Windows Mobile device – I’ve worked extensively with Windows Mobile and its predecessors, and it’s not an operating system I would inflict on myself. clamhead – I’m in the ADC, I’ve downloaded the SDK and built some applications, so I don’t think I’m at all out of the loop on this. But even to non-developers I think the SDK issue is important: it directly affects the richness and polish of applications available for the phone to keep developers from communicating with one another. Dave – Love is indeed worth something. It’s *almost* enough to get me to buy one. But not quite. Mike, your reasoning is pretty sound, but I have to say I love my iPhone. Of course, I have the “old school” 2G version, so I’m not paying extra for poor 3G coverage, fair enough. Flash would be a nice to have, at least as an option, but it hasn’t really been a problem (especially with the YouTube support). I think Apple (at least in the 2nd Jobs Dynasty) has been very much about controlling the entire experience, and the poor performance of AT&T this far sort of underscores the reason for that. That’s a tradeoff of (theoretically) a better experience versus openness and democracy. Having said all of that, this is the first phone I’ve actually loved, flaws and all. And isn’t love worth something? One of the reasons you wouldn’t buy an iphone is because of the sdk/nda? What conceivable difference would it make to you if you’re not a developer… and if you were a developer and in the loop you might understand some of the reasoning behind it. I forgot about the fact that the 3G coverage is not everywhere. I was going to get an iPhone and then my wife and I got Blackberry’s instead. Now I don’t want an iPhone anymore. The Blackberry is so reliable. I use Apple products for just about everything else though. I love how you contradict yourself with #2. Not having flash is great! Also, the iPhone is not meant to replace your computer, you cannot wait a few minutes to change your GrandCentral numbers. I am curious as to what phone you have. Is it a WinMo phone that has a pseudo IE as the browser? The reasons listed, aside from #1 & #2 can apply to any device. iPhone a must for web workers? Hardly. There are dozens of smart phones out there that will handle the Internet, basic word processing, etc. But as a web worker I’m not necessarily mobile all the time (I have a home office) and even my cell phone is rarely used. HOWEVER, even when I do go out, I take the whole laptop because the nature of my business requires full computing. As a web worker for 6 years, I can safely say there’s not a thing in the iPhone that I can’t have with the gadgets I already own. I would say for web workers the iPhone is a must. I am amazed you write such an article, really. My reason #1 – iphone security is not suitable for business (and I wouldn’t trust it personally either). My iPhone rocks my world. It could rock your world too. For what it’s worth, there is a 3rd party app for Grand Central called Grand Dialer that is pretty slick. I’m very happy w/ my iPhone. Apple is acting like a business that has a huge sunk cost, but still has first mover advantage. That’s fine with me… it just creates a market for more open devices. In the mean time I’m happy to have the real Internet available to me just about anywhere.